Coach Springer presents these 3-point shooting drills. Diagram A. Players take turns passing to the coach for receive a catch and shoot. The others players waiting are doing front to back line jumps on the 3 point line (where players jump back and forth over any line quickly to build foot speed). Competition. First to a certain # wins. Diagram B. Teams work to hit certain amounts of 3's before the other teams. Players shoot and follow their shot while their partners get to a spot. Every missed shot, the team must sprint to the other side of the court and start shooting. Diagram C. Players start in the corner with a ball. They pass to the coach and flash to the wing. Players must move 2 feet off the line so they can play to everything on the catch. 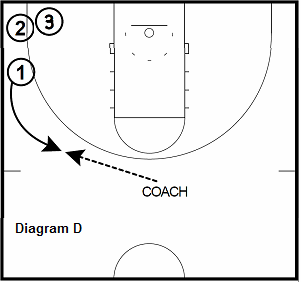 Diagram D. Coach passes ball back to player. On the catch, player squares into the shot then explodes into a catch and shoot 3-point shot. Variance: Players score with one dribble jump-shots and step-backs. 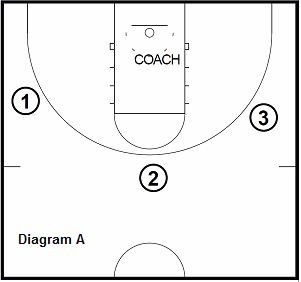 Diagram E. Gun passes to coach. Coach passes to 1 who uses over head pass to reverse the ball. 2 catches and shoots the 3. 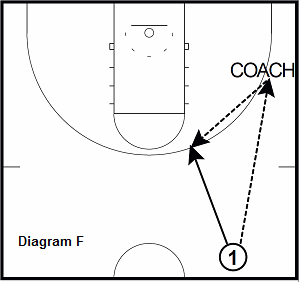 Coach alternates the wing he passes to and the drills in continuous. Goal: Make 10 out of 12. Progression: 1 dribble jump-shots to the baseline. 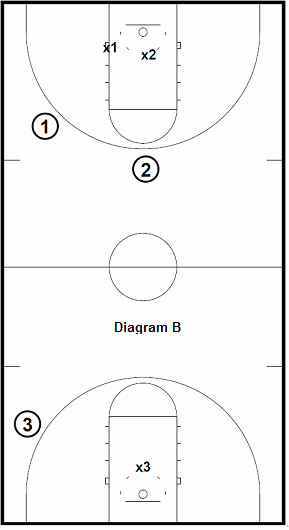 Diagram F. Player kicks the ball ahead in transition and fills into the top of the key. Gets the ball back and shoots the catch and shoot 3 pointer. 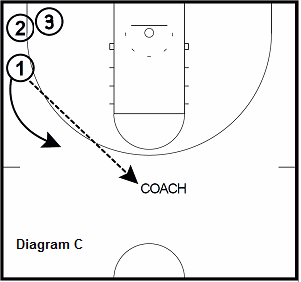 Drill: Kick ahead to coach and sprint to the top of the key for a catch and shoot 3. 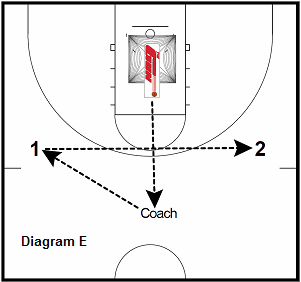 Make 20 from each side of the court.